Over a 100 years ago, the first known woman wine grower in California, Dona Marcelina Felix Dominguez, grew Mission vines on her Santa Barbara County property. The vines survived, and when Deborah Hall, a former nurse, and her late physician husband, William, bought the property in 1994, they discovered these vines under a heavy cover of brush. They originally thought the vines were Zinfandel, and sold them as such to other vintners. DNA testing at University of California Davis later revealed that they were Mission vines. Mission vines were brought into California in 1767 by Spanish Padres from Mexico who established a chain of missions from San Diego to Sonoma from 1767 to 1833. Deborah’s ancient Mission vineyard of three acres is part of only ten acres still growing in California. She has named the ancient Mission vineyard Dona Marcelina’s Vineyard and today, it is the oldest producing vineyard in Santa Barbara County. 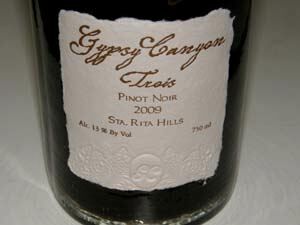 Using a recipe written in 1891 by Emile Vache, Deborah crafts a Gypsy Canyon Ancient Vine Angelica, a rich, fortified dessert wine from the Mission grapes. The original Gypsy Canyon property was 290 acres and included an 1800s farmhouse. After Deborah’s husband passed away in 1997, she sold 160 acres (with 18 acres of vineyards) and kept 130 acres with 12 acres of vineyards to herself. 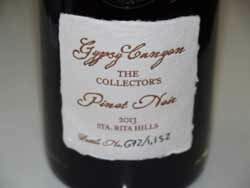 Her original intent when she bought the property was to produce Pinot Noir. 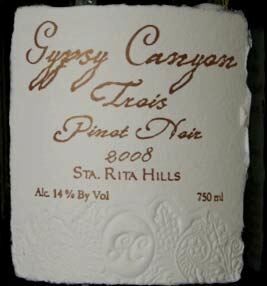 There are 4 acres of clone 115 and 777 Pinot Noir and some Pinot Gris planted on the Gypsy Canyon Santa Rita Creek Vineyard. The initial winemaker was Norm Yost (Flying Goat) who crafted the wines in the Lompoc “ghetto, but Deborah has taken over the winemaking duties. The site has an exceptionally cool microclimate compared to other vineyard sites in the Sta. 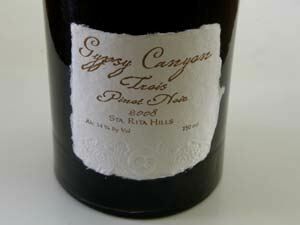 Rita Hills AVA. Farming is largely by hand and is both organic and biodynamic. 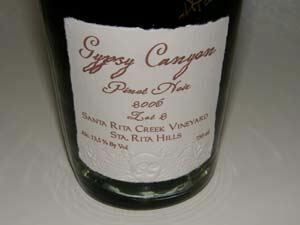 The first release of Pinot Noir was in 2004. 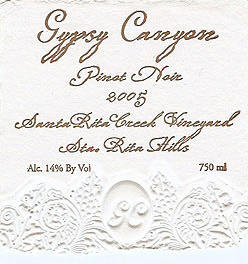 The Gypsy Canyon package gives a nod to California history and is quite striking. Deborah uses a hand blown glass bottle of historically correct shape with an embossed glass seal, a handmade paper label, and a beeswax seal. Each bottle is numbered and signed by Deborah Hall. All of this historical aesthetic adds to the appeal of the wine inside. 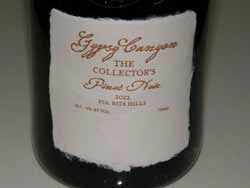 The Pinot Noir is quite good and remarkable for its elegance and layered complexity. The wines are sold through a mailing list. Tasting by appointment. The wines are costly, but no expense is sparred in producing these unique artisan wines.